English Activities is a free online English learning resource for kids and young adults studying ESL, EFL or ESOL. English Activities provides a full course of FREE learning lessons, games and tests to help children (and adults) to become profficient speakers at a simple level. The frog flies - learn English free with the frog! Choose from over 100 different English topics, all free! Free online Games for learning English and having fun! 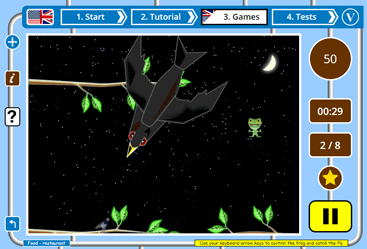 English Activities provides all its online lessons, English games and tests absolutely free. There are no hidden charges and no time limits when using the website. Being free doen't mean it looks bad either...we try to make our online resource as pretty and easy to use as other paid websites. English Activities is a free online English learning resource created and published by ic language in South Wales. ic language publish other free learning sites for French, German, English EFL ESL, Spanish and Welsh. All of these sites use the language materials (pictures, texts and audio speech recordings) originally created for Teach Online, our online language teaching resources. The learning games, lessons and tests for English Activities have been developed for the use of individual language learners studying alone and are suitable for those starting to learn the English language. Who uses our free english online resources? English Activities is primarily designed for children between the ages of five and sixteen who have a limited knowledge of English (ESL EFL or ESOL). Ideally it compliments a structured school course but English Activities could be used as a primary source of language provided the child has some guidance initially. And if you go to a school which can't afford paid online English resources, imagine how happy they would be to hear about our free resources! What makes English Activities so friendly to use?